Normally we would be sharing top 5 TV shows or movies of the month later this month. However, instead we interrupt the normally scheduled post to talk about most talked show on Netflix! Well, because everyone is! Little bandwagoning here but I was dying of curiosity! So much controversy, everyone has an opinion. It's all over Facebook and Twitter, so I had to watch it. 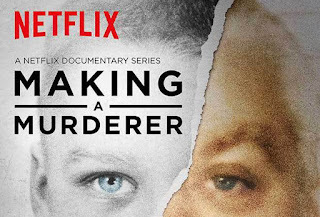 It is intense to say the least, it's the true story about a man, Steven Avery who was wrongfully accused of a crime and was released in 2003 after spending nearly two decades behind bars. Two years after he was released he was charged, along with his nephew with the murder of Teresa Halbach. 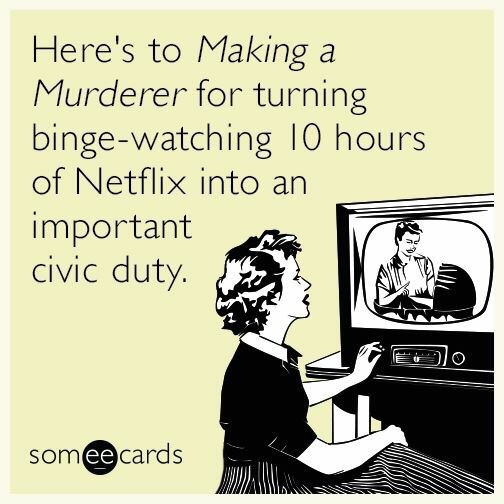 Let's just say everyone binged watches this show. Now to the part that everyone is talking about, without ruining this for you, as many other people who have written about this have. Yes I know you can google it, but I prefer to live in suspense as I watch. I DO NOT LIKE SPOILERS. Okay, I digress. Everyone is talking about the trail and how the evidence of this case was handled. I for one believe that the confession should be thrown out along with the physical evidence considering how it was found. I know I'm no lawyer but I have seen enough criminal drama shows to know about chain of custody, evidence tampering, and that a minor cannot be interviewed without a parent or guardian present. Go and watch it! It's seriously addicting and if you are anything like me you will be shouting at the TV for a lot of it. A little disclaimer, there are boring parts and it is a documentary so keep that in mind when watching. Have you guys seen it already? What do you think? Guilty or Innocent?